OTP: An Encoder/Decoder For One-Time Pads written by Karl Fogel. A test for artificial intelligence suggested by the mathematician and computer scientist Alan Turing. 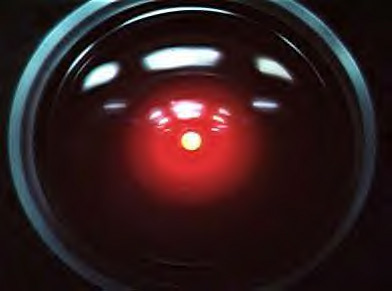 The gist of it is that a computer can be considered intelligent when it can hold a sustained conversation with a computer scientist without him being able to distinguish that he is talking with a computer rather than a human being. Some critics suggest this is unreasonably difficult since most human beings are incapable of holding a sustained conversation with a computer scientist. 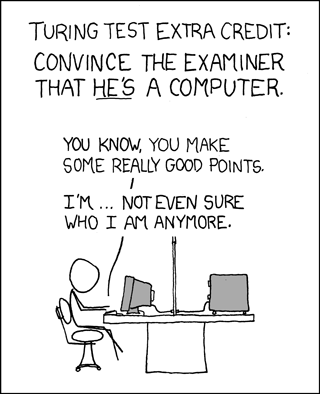 After a moments thought they usually add that most computer scientists aren’t capable of distinguishing humans from computers anyway. Source: The Guide to Life, The Universe and Everything.